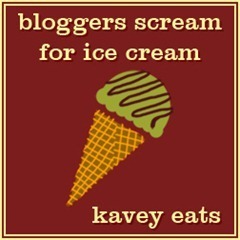 When I learned that this month's Bloggers Scream for Ice Cream challenge was for something fruity, I knew that I didn't want to do just a strawberry, blueberry or raspberry ice cream. They are all lovely ice cream flavours, but I've been cooking a little bit with white chocolate lately and decided to try and incorporate a fruit that would go really well with white chocolate and that wasn't normally used in making ice cream. And as I pushed a squeaky trolley around my supermarket one rainy afternoon, I found it: Nectarines. As people jostled and pushed past me (the fruit and veg aisle in our local Sainsbury's is like a war zone), I stood for a second, trying to imagine the sweet, scented nectarine against cold, creamy white chocolate. And it worked. You need to choose ripe nectarines that give a little when you prod them with your finger. Forget hard, unripe ones - they'll be too sour. I reckon this could also work well with peaches, too, if you have any sitting around. This is one of my favourite ice creams I've made so far: sweet, creamy white chocolate ice cream with a sweet-sour crystallised ripple of nectarine purée running through it. Perfect. Chop the nectarines into bite-sized pieces and heat them in a pan with 1 tablespoon of vanilla sugar (just use regular caster sugar if you don't have any). Leave for about 5 minutes and they will soften and turn a bit jammy. Turn off the heat and leave to cool. Pour the double cream and the milk into a small saucepan and heat gently, until you see steam coming off it but it's not yet boiling. Whisk together the egg yolks and the sugar in a separate bowl - they will clump together straight away into a paste, but keep whisking and the mixture will loosen into a thick custard. Splash a little of the hot milk/cream mixture onto the whisked egg yolks and whisk in straight away to prevent lumps forming. Gradually pour in the rest of the warm milk and cream and whisk until combined. Scrape the slightly cooled, melted white chocolate into the ice cream mixture and stir to combine. Leave to cool completely. Churn the cooled mixture in an ice cream maker for 25 minutes. When the ice cream has churned and is thick, purée the nectarines with a stick blender until smooth. Gently fold this cold purée into the churned ice cream to create a ripple effect. Scrape into a freezable container and freeze for at least 3 hours, or until firm. Are there any other fruits that should be used more often in icecreams? I must must must get an ice cream machine! Oh yes yes yes I adore nectarines and peaches, why dont we enjoy them more in ice creams? Lovely combination too!